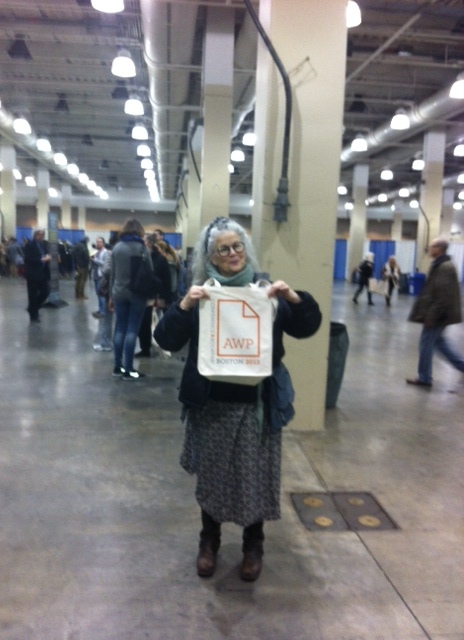 Was the last time I felt giddy with excitement a year ago already, writing a blog about going to my first AWP? I remember being anxious at the thought of 13,000 writers and publishers in Haynes Convention Center, and me, a relative nobody, a small town Vermonter in my signature gray UGGS, sodden with the March slush of Boston. Giddy came later, when I picked up my friend who was going with me. A friend that I am out of touch with now, an irony given that I am working up my anthology, “DUMPED: Women Unfriending Women.” And while I am not dumped in any classic way, like the stories I am collecting for my book, there is an unsettling distance. No giddiness this, a sobering year, indeed. The losses of several dear friends, not to dumping, but to death. Maybe the ultimate dumper? And maybe my perseveration on loss makes me less fun to hang around with? I will not mention my cat. Or my writers group. Dead, dissolved. Enough, please. In art school, Japanophile that I was, I read that pottery apprentices in Japan were forced to throw 500 one-handed bowls on the wheel, keeping none of them, before they could even call themselves students. Every morning for weeks I went into the studio, alone in the silence before 6 am. My Marlboro glowing on the edge of the work table where I would balance it in a wad of wet clay. I threw those one-handed bowls, one after another, tossing them into the slip bucket even when they were perfect. I would allow a moment of nicotine-fueled giddiness, perhaps, just a transient moment. Forty years later I feel that I should have this patience thing, this discipline thing, this grief thing, down. But then again, that’s the whole of it right there. And I don’t smoke anymore. Only one person has asked me if I was going to AWP this year. Someone on Facebook. No, I won’t be standing in line in Seattle on Wednesday to get my tote bag. Nor did I sign up by yesterday to schedule an off-site event. And yes, when I perused the workshop offerings this year, my throat twisted at “A bag full of god- female memoirists with daddy issues” and “Invisible geography- writing trauma, pain and loss.” And those are just in the first morning of the conference! This year, still mired in the Vermont gray, the monochrome of ruts and empty fields, I am teaching two day long classes on psychiatric nursing, and most of my writing time is documenting my patients’ pain and loss for the other four days a week. On the seventh day I have feverishly revised two serious essays on mental health. Did a fun piece for the Brevity blog. Oh yes, and have been as yet unsuccessful in setting up my LLC and business account for my contract with SHE WRITES PRESS as it is very hard to get anything of that nature done in my little state with only a few hours a week to get anything done. Some discipline, little done. Yet. And then there’s the loneliness of this long winter. But. We hope there is always a yet or a but to counteract the tedium. But I have a friend who is a lawyer and always helps me with contracts. But I met a woman who feels friendly and is putting together a publicity package for DUMPED. And I have a spate of writers with whom I have developed e-mail relationships, women who have sent me beautiful pieces of their lives in the form of essays for the collection. Not giddy-making, just useful hard work. And I have a year. A year until AWP on April 8, 2015 in Minneapolis. A year to register, book in hand. Book in hand. Like the lessons learned so long ago. Fallow fields. 500 bowls. Categories: Uncategorized | Tags: AWP | Permalink.